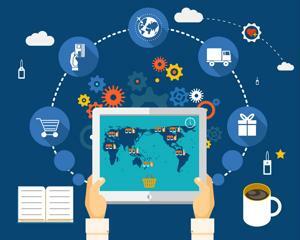 The Internet of Things has initiated a dramatic shift in supply chain management. Machina Research recently revealed that by 2024 the IoT global market is expected to reach approximately $4.3 trillion, and Gartner reported an estimated 25 billion artificial intelligent devices will be embedded in systems 2020. As technology advances, supply chains are presented with increasing amount of applications that make operations more cost-effective and efficient. And while advanced digital devices provide the benefits of more control, increased visibility and enhanced access to all operations within supply chains, there are particular segments that have the most to gain, such as logistics and manufacturing. Using sensors grants international supply chains the capabilities of seamless tracking and measuring. Enterprise Apps Today pointed out that some companies have been especially progressive in their employment of digital technologies in warehouse operations. For example, throughout its warehouse plants, General Motors uses Cisco-supplied passive sensors to monitor climate conditions for vehicle painting. Not only can these electronic efficiencies help improve the effectiveness and flow of inventory management, but they can also assist with specific concerns such as allergen detection and product expiration alerts. Digital applications can even be used in supply chains to ensure worker safety. Boeing, Enterprise Apps Today noted, uses a real-time locating system produced by Zebra to track the location of its employees throughout the warehouse and monitor the safety levels of workers' harnesses. As companies shift supply chains toward the Internet of Things, employing solutions guaranteed to provide longevity and sustainability, there should be an expected period of adjustment. In the same article, Zebra Technologies Director of Supply Chain Solutions Mark Wheeler told Enterprise Apps Today that a major obstacle supply chains turning to digital technologies will face is security. "A key challenge is securely managing the complexity of the implementation and enabling the power and dynamism of cloud computing to analyze the data provided and deliver value to the enterprise user," he explained. The upside, the source added, is that companies will have increased insight and visibility that provides a platform for more accurate monitoring of operations, which is where data comes into play. Rigzone reported that Evelyn McLean-Quick, Hess Corp. vice president of global supply chain, believes successful transformation hinges on utilizing Big Data "to enhance safety and productivity against the backdrop of supplier collaboration and accountability." She also added that one of the biggest pitfalls companies can fall victim to is implementing major changes without a thorough assessment of possible long-term effects. Patrick Van den Bossche, global coordinator of operations practice at A.T Kearney, suggested in a CFO article that supply chain companies should use "digital sprints" to collaborate and brainstorm, an approach that he said is a more cost-effective option for experimenting with the IoT. By using these sprints as a test tool and experimenting with prototypes, companies will be able to see how digitization would affect manufacturing processes. Though digital technologies can lead to cost reductions and savings and improve the life cycle of products along the supply chain, it is essential that companies track and measure ROI. Tom Davenport, a senior adviser at Deloitte Analytics, recently published an article for a blog hosted by The Wall Street Journal that highlighted how applying new electronic developments requires both time and financial investments. "Measuring the ROI on those investments, however, will depend on the problem being solved," he wrote. "For example if the problem is customer retention and the issue identified is service responsiveness or product outages, maybe the IoT solution is assessed by reduction in the response time, pre-identification of product failures, or ultimately customer turnover or all of the above." Davenport also identified the five key stages of assessing the IoT's value: creating, communication, aggregation, analysis and "use of information from real-world objects by real-world objects." As the digital revolution produces more opportunities for supply chains to incorporate technology into their operations, it is important for companies to first conduct thorough and comprehensive evaluations of possible the influences such transformations could have on processes before making any significant changes.